Chlorine does a great job of eliminating germs and bacteria in swimming pools, but it does take its toll on your hair. Since chlorine is a corrosive agent, it not only eats away at germs in pools, but also at the living tissue in hair follicles; leaving hair weak, brittle and in danger of falling out. By taking preventative methods to protect your hair while swimming, you can avoid potential hair loss. One of the simplest steps to take when going swimming is to wear a swimmer’s cap. A swimmer’s cap will allow you to enjoy your swim while keeping most of the chlorine water out of your hair. Choose a latex or silicone cap as they fit more snugly on your head and are thicker and softer for your hair. Before getting in the pool, wet your hair first. 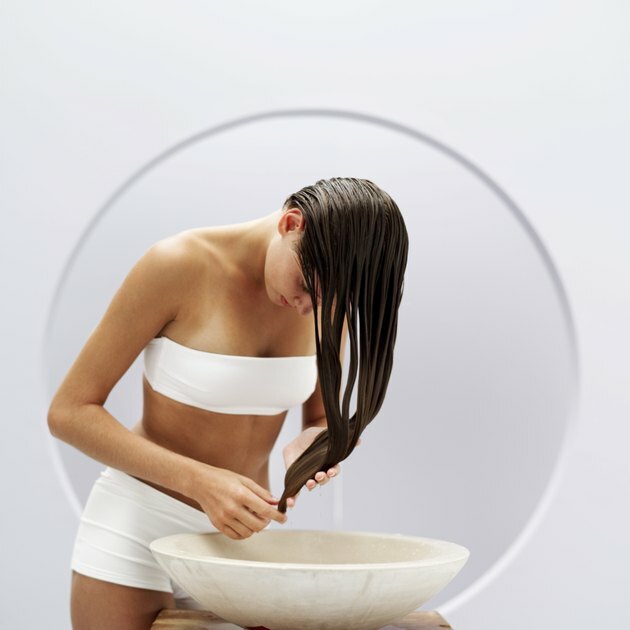 Dry hair acts as a sponge when it comes in contact with water, so it is best to wet it with non-chlorinated water before it comes in contact with the pool water. Since your hair has already absorbed the clean water, it is less vulnerable and less likely to absorb the chlorine in the pool. Another way of protecting your hair is to rinse it with clean, non-chlorinated water after swimming to get rid of any residual chlorine. After wetting your hair, apply conditioner to it prior to getting in the pool. Conditioner provides a layer of protection to your hair follicles, sealing the cuticle and preventing the chlorinated water from penetrating the hair. The conditioner will strengthen the hair follicles, protecting them from damage and loss. While all of these methods are effective in minimizing chlorine exposure to your hair, it is still important to wash your hair thoroughly after a swim. You should wash your hair immediately following your swim and run it under warm, non-chlorinated water for three to five minutes. Wash your hair thoroughly with a clarifying shampoo and then follow with a leave-in conditioner. Following these steps after every swim may seem like a lot of work, but it will ensure that your hair stays healthy and chlorine free.